Review: Syd is an orphan and a proxy. He is the one to bear the physical punishment whenever Knox, his patron, breaks a rule. Unfortunately for Syd, Knox is not all that fond of following the rules. In a nod to the middle grade novel The Whipping Boy and A Tale of Two Cities, Alex London pulls readers along on an exciting and dangerous ride in the future. This future world is filled with greed, extreme poverty, and corruption. Knox and Syd are both used to the way their world works and have not been trying to change the system, but over the course of a few hours, they start re-evaluating their beliefs. After Knox crashes a car and kills a girl, Syd is beaten and imprisoned. This sets in motion a chain of events that will radically change both of their lives. The pages of this book are packed with action and suspense and I did not want to put it down. In addition to being a proxy, Syd also happens to be a gay person who describes himself as brown. These things are not the main point of the story though. This is not an issue book, but a dystopian novel that happens to have a gay main character who isn’t white. We need more stories like this. All of this may seem very serious, but London does scatter a few doses of humor on the way. I appreciated those light moments. 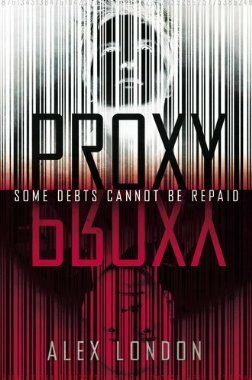 Recommendation: Buy it now if you are a fan of dystopia and especially if you are a fan of The Whipping Boy with it’s humor and fast pace. If you would like to get a taste, preview the first three chapters below.